Senior leaders from Santander have visited City, University of London to attend an event celebrating the decade-long partnership between the two organisations. During the event, City showcased projects that have been funded by Santander Universities and students who have benefited from this funding shared their experiences with the guests. Deputy CEO of Santander, Javier San Felix and Matt Hutnell, Director of Santander Universities were among the visiting delegation from Santander. Santander was first linked to City more than ten years ago, when they partnered with Cass Business School. This was the bank’s first educational partnership and was followed by a collaboration with the entire University three years later. Since then, Santander has provided more than £1 million funding to City, supporting hundreds of students. 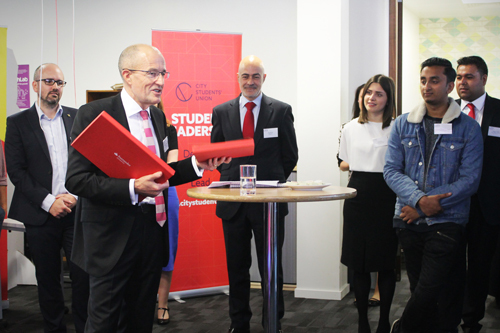 The celebratory event, hosted at the City Launch Lab, was a chance for Santander leaders to see the impact their support has had on the University and its students. Projects showcased included the City Launch Lab, City’s startup incubation space; the Santander Universities Employability programme that helps students to find work after graduating, along with leadership programmes and scholarships that support students during their studies. 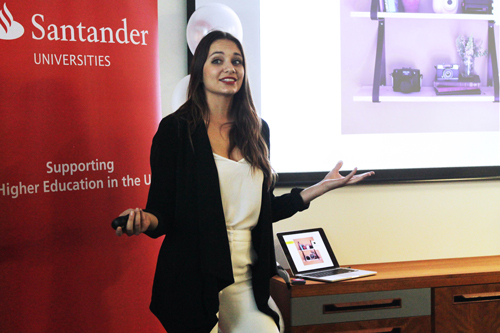 Santander also fund an internship programme allowing students to do placements with local small businesses. The City LaunchLab, has benefited directly from Santander funding. Alex Elkins, Head of Entrepreneurship Education gave a speech highlighting some of the areas the funding has helped with, announcing two new initiatives they will be supporting in the future: AccountEd a financial service for startups and the return of CityUnrulyversity, a popup university providing free lectures and talks with successful entrepreneurs. Student startup and Launch Lab residents Tryatec also gave a speech to the guests about their business, explaining how the Santander funding has helped them to progress from just an idea in 2015 to their planned launch in July 2017. President of City, Professor Sir Paul Curran thanked Santander for all their support over the past decade, highlighting how their targeted approach to funding has allowed it to make a real positive impact. Santander is now the world’s largest donor to higher education spanning 20 countries and supporting over 28,000 scholarships and grants.